Struan Stevenson is a former member of the European Parliament and chair of the Delegation of the European Parliament on Relations with Iraq (2009-2014). He was in Tirana this week in the framework of the visit of the EP delegation, consisting of Tunne Kelam, member of the foreign affairs committee and deputy chairman of the group "Friends of a Free Iran" in the EP, Jaromír Štětina, deputy chairman of the subcommittee security and PE protection. 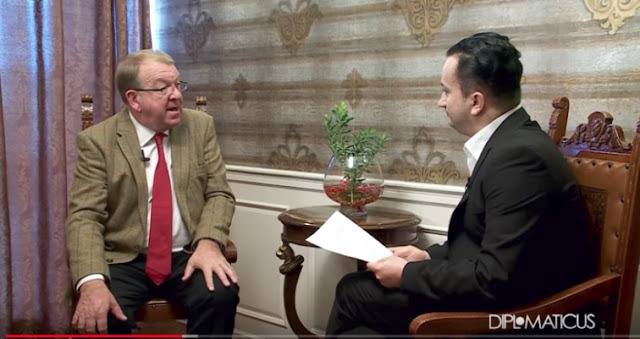 Stevenson gave an extended interview for the "Diplomaticus" show in "News 24". Speaking to journalist Erion Kaçorri, he thanked Albania for opening doors for members of the Iranian opposition who are at risk of life if they return to their country. "The Albanian people have a great heart. They have accepted Iranian refugees to live in Albania at a time when no European country was prepared to do so. Iran has the worst record of executions per capita compared to any other country in the world. In Iran are executed more people than in any other country in the world. They execute more than in China. They imprison people only because are political dissidents." says Scotland's politician, who also points out that the members of the MEK are at risk also in Tirana. Commenting on the nuclear agreement between West and Iran, Stevenson states that this agreement was not good at all. "Obama desperately wanted to leave his mark on history because he had not achieved anything on the international scene after being on duty for two presidential mandates. But unfortunately, through the deal, a hundred and fifty billion dollars of frozen assets returned to the Iranians and they used this money to fund Bashar Al-Assad to continue the civil war there. They used this money to fund Houthi's rebels in Yemen, to fund Hezbollah in Lebanon, to fund Shiite militias in Iraq, so all that the nuclear agreement has reached is the spread of Iran's negative impact on the Middle East with more acts of violence, says the well-known Scottish politician to News 24.